Several open-source implementations of the incomplete beta function already exist, but none of them were going to work for my project. The GNU Scientific Library has it, but it's a large dependency that you may not want to pull in for a single function. 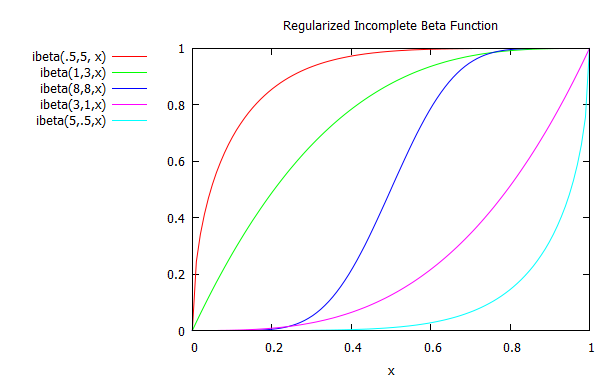 The incomplete beta function itself is somewhat intertwined with the library, and may not be easy to extract and use separately. It's GPL licensed. The Cephes math library also has an incomplete beta function implementation, but it's a large function and the licensing is very uncertain and questionable. The book Numerical Recipes has a very nice and short Incomplete Beta Function, but its licensing basically makes it unuseable. Despite that, I do recommend the book as a nice reference. After looking around, I couldn't find a small, simple, and easy to use incomplete beta function in C with a liberal license. That's why I wrote my own from scratch. Our starting point is the continued fraction representation, taken from the Digital Library of Mathematical Functions here. Luckily, C99 gives us a log-gamma function, lgamma, which we can use. Keep in mind that adding logs is the same as multiplying. This works much better for us, because if we actually computed the gamma function itself it would quickly overflow. If you don't have a C99 compiler, then you'll need to implement log-gamma yourself. You can refer to the graph above to see the symmetry visually. Solving a continued fraction isn't exactly straightforward. You could, of course, just pick a point on the right and start solving right-to-left. The problem, however, is that you don't know where to start. You'd just be guessing and you have no way to refine your answer without starting all over. I'm going to use Lentz's Algorithm to transform the continued fraction into something we can actually solve. It is useful to iterate until C*D becomes small. Also note that you must ensure C and D never become zero (or you'll have a divide-by-zero issue). In practice, this is done by setting C or D to a very small value if either becomes too close to zero. With the above equations, I think coding up the incomplete beta function is fairly straight forward. See the Github repo for the latest version. As I mentioned previously, the incomplete beta function is very useful when working with Student's t distribution. Here's code for the cumulative distribution function. It's useful for statistical test such as difference of means. Numerical Recipes 3rd Edition: The Art of Scientific Computing I highly recommend this! You can't use the code (because their licensing isn't permissive), but their explanations are good. It covers a ton of ground. Statistical Shortcomings in Standard Math Libraries An interesting article I came across about C not having a great selection of special math functions. If you find the code or the explanation useful, please leave a comment below.